…providing recognition to the significant Irish contribution to World Peace from County Mayo, Connaught, Ireland. The members of the committee have collectively undertaken the project on a voluntary basis with no expectation of individual or collective reward, financial or otherwise. We are immensely grateful to all those who have given assistance to the project to date.Donations to the Mayo Peace Park will be gratefully accepted. The annual Remembrance Day Service to commemorate the World War dead began in 1999,when Mr Michael Feeney, MBE organised an official Remembrance mass in the Church of the Holy Rosary in Castlebar following research which showed that a significant number of County Mayo soldiers were killed in action in World War I and World War II. Mr Feeney was made an MBE by the Queen Elizabeth 2 in recognition of his service to Ireland-Britain relations through the County Mayo Peace Park and Garden of Remembrance project. The President of Ireland, Mary McAleese, performed the official opening of the Mayo Peace Park, Garden of Remembrance, on Tuesday the 7th of October 2008. The memorial park is situated in the centre of Castlebar fronting the old town cemetery opposite the Harlequin Hotel. Mayo Peace Park commemorates all those who served and died in the major world wars & conflicts of the past century as well as in other wars & conflicts. It was developed to remember a forgotten generation of brave heroic local people from every town and village of the county, whose service & sacrifice had been ignored and forgotten, indeed airbrushed out of modern Irish history until recent times. They had served with the Allied Forces in the world wars, in particular with the Australian, Canadian, United States, United Kingdom and Commonwealth, New Zealand and South African Forces. 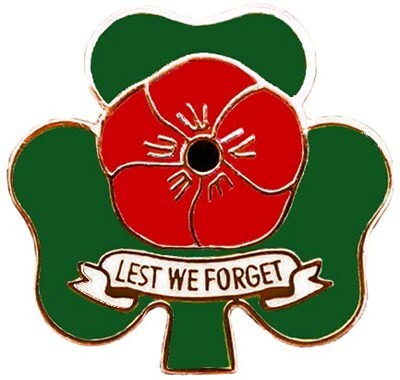 Two of the Mayo men to die in foreign conflicts were soldiers of the Irish Defence Forces, Private William ‘Billy’ Kedian from Ballyhaunis, and Corporal Fintan Heneghan, from Ballinrobe, who died as part of UNIFIL Forces on United Nations peacekeeping operations in the Lebanon. The Mayo Peace Park committee erected a special memorial in their memory, it was the first memorial to commemorate them. The most recent Mayo soldier to die in action, was a Royal Marine named Robert McKibben from Westport, he died in Afghanistan on the 12th of November 2008, his funeral was one of the largest ever seen in Westport, this had a profound effect on the whole community, it really brought home to everyone the brutal reality of war and a better appreciation of those who died for the peace we enjoy in our world. Robert McKibben was a long time member of the Irish Defence Force Reserves before he joined the Royal Marines. There is a special memorial dedicated to Robert in the park, he was the first Mayo soldier to be killed in action since the park was opened. There is also a special memorial dedicated in memory of all those who died for Irish Freedom in the park. It also honours the memory of all the officers of An Gárda Síochána who gave their lives in the service of Ireland. The Mayo Peace Park, remembers all those brave people, in a most respectful manner, it is a tranquil oasis of peace and respect, it offers the families of the fallen, a place to say a silent prayer and reflect on the lives and sacrifice of their loved ones. The Mayo Peace Park has consigned the ignorance and bitterness of the past into history. It does not attempt to glorify or justify any war, its purpose is to commemorate the memory of the people of County Mayo who died in them.